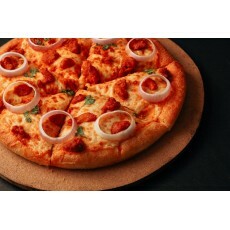 Finely cut chicken breast pieces blended in BBQ flavored sauce topped with red onion rings and fresh garden capsicum,mushroom and black olive Size: 13 inches .. 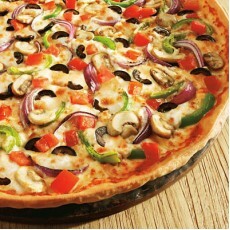 Finely cut chicken breast pieces blended in BBQ flavored sauce topped with red onion rings and fresh garden capsicum,mushroom and black olive Size: 10.5 inches .. 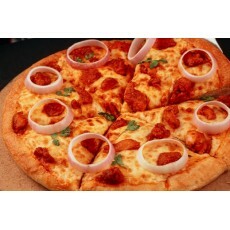 Finely cut chicken breast pieces blended in BBQ flavored sauce topped with red onion rings and fresh garden capsicum,mushroom and black olive Size: 6 inches ..
Chicken Alfredo Pizza is flavored with garlic butter and a creamy alfredo sauce and topped with diced Chicken and Basil ..
Succulent pieces of chicken cooked with fajita spices,topped with green capsicum,fresh onions,black olives,cilantro and fresh mozarella cheese ..
Tender pieces of chicken breast fillet flavored with original tandoori seasoning and topped with red onion rings and fresh green cilantro Size: 13 inches ..
Tender pieces of chicken breast fillet flavored with original tandoori seasoning and topped with red onion rings and fresh green cilantro Size: 10.5 inches ..
Tender pieces of chicken breast fillet flavored with original tandoori seasoning and topped with red onion rings and fresh green cilantro Size: 6 inches .. 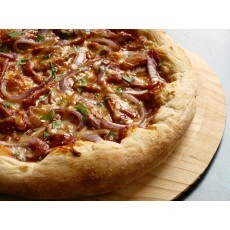 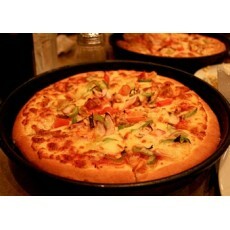 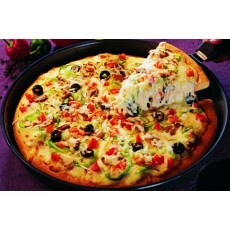 Finely cut pieces of grilled chicken mixed with onions,green bell pepper and diced tomatoes Size: 13 inches .. 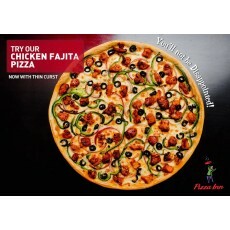 Finely cut pieces of grilled chicken mixed with onions,green bell pepper and diced tomatoes Size: 10.5 inches .. 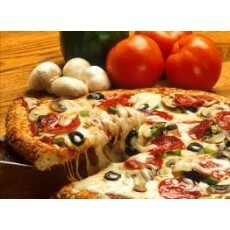 Finely cut pieces of grilled chicken mixed with onions,green bell pepper and diced tomatoes Size: 6 inches ..